Each and every one of our western spurs are on sale now. Take a look at our spur collection and we are certain you will find what you are looking for. All of the Silver Engraved Overlay Western Spurs that we offer are high- quality and very durable. This western spur features a 1/2'' band with silver overlay. 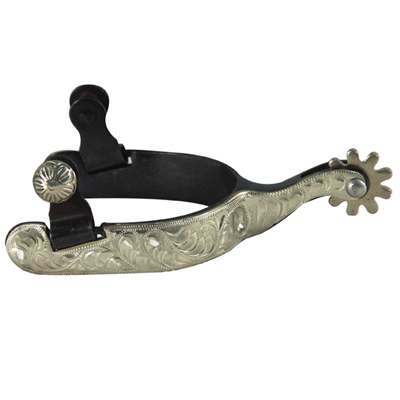 In addition, they have added a 9 point rowel and a 1 1/2'' shank to this beautiful spur. We strive to offer the lowest prices for our quality products and your complete satisfaction is our number one priority here at Horse Tack Now.